I just finished a shawl that I thought might be of interest. It's entirely hand-dyed, the warp in orange silk and the weft in 24 shades that fade gradually from fuchsia to electric blue, giving the appearance of continuous color change throughout the shawl. I posted it on Weavolution, at http://www.weavolution.com/node/4563 . It's a neat concept, and one that I think is worth trying, if you have the time to sample and hand-dye all the colors. It doesn't take nearly as long as it sounds, since I dye in quart mason jars and you can fit 6-8 of them into a canner, so I can dye 8 colors at once. With 24 colors that's only three batches! I dyed at 2% weight of goods (2g dye for every 100g fiber) using fiber-reactive dyes (Cibacron/Sabracron F). Before I started I did a full set of samples - see http://www.travelingtiger.com/crafts/dyeing.htm for my methods - so I could be sure I got the right range of colors. That was when I discovered that the transition from fuchsia to purple happens very quickly, and I'd need to start off very slowly when adding the blue. In total it took 29 skeins to effect a gradual transition from fuchsia to turquoise, but it was well worth the trouble. (Don't look so horrified - I dyed it in mason jars in a canner so I could do 7=8 skeins at a time. The worst part was winding off all the yarn into balls afterwards - I was using 30/2 silk and it took FOREVER!!!) To go from red to yellow, 20 skeins. 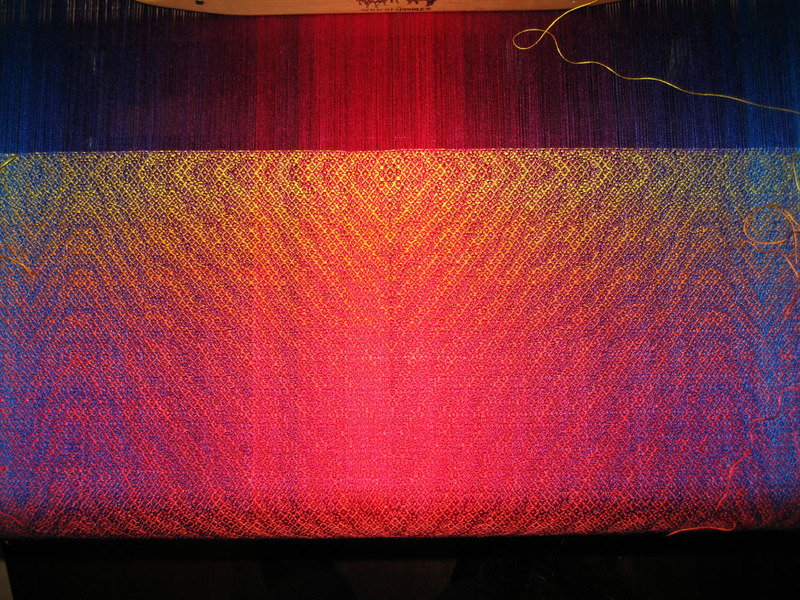 The structure for the shawl pictured in my original post is mostly plainweave (thus the lovely iridescence), so it's a balanced weave - but the other two shawls are a network drafted pattern on a rosepath threading, I think very slightly unbalanced, but not sure. I am now planning some work in 60/2 silk...I'm going to wind a bunch of 50-gram skeins and make up a gradual transition around the entire color wheel - from fuchsia to yellow to turquoise and back to fuchsia, going through all the greens, oranges, and purples on the way - that will give me enough yarn to do a LOT of shawls in color-changes! I'm guessing it will take me about 100 skeins, but since I recently bought 6 kg of 60/2 silk (planning to use it for my wedding dress, but I'm trying to use 120/2 silk instead), I should have enough. I really LOVE the effects you can get with a gradual change in colors! Lovely Tien! We need a gallery with all of these is one place: photos are good, but the cloth in real life..... The iridescence is just breathtaking.